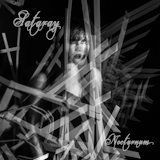 One-woman dark ambient project Sataray makes the Suldusks of the world seem positive and uplifting by comparison. Nocturnum lives down in the Morlock tunnels of ambient sound, with hisses, croaks, and moaning incantations from the author sharing the blurry mix with delay- and reverb-filled MIDI keyboards, all slowly writhing at the bottom of a murky pool of sound. Fans of drone and the slower type of industrial will likely find this more enjoyable than the lover of the energetic. The songs are as slow as any regular ambient song, but with the added oppression of the dark mood added by cold minor keys and vocals that are twisted into something virtually unrecognizable by electronic filters. While the gothic sound of DarkMoon is fairly listenable, songs like Sparrow are painfully repetitive. I'd prefer to hear more keyboard work and less vocals. Maleficum Pt. 2 is better -- possibly even the best on the album. Drums, shuddering from the reverb, give structure to this track that focuses the sound, and Sataray's hissed vocals are better than the moans used on the preceding songs. The other tracks made it hard for me to like Nocturnum -- I found the lack of energy and sameness of many of the songs to be a big turnoff, but for a ritual ambient album, the dragging pace of the tracks, the indistinct vocalizations, and the dreary, aimless tunes might be described by a fan as virtues, not vices.